The North-eastern states of India: Nagaland, Assam and Arunachal Pradesh form a special destination. The states are in a remote area of India where India, Southeast Asia and the Himalaya States Bhutan and China come together. You'll find clashing cultures, different climates, landscapes and peoples. There are not many places left in the world where the maps show white spots, snowy mountains remain nameless and unclimbed, hill tops are filled with ancient forests, rhinos live in swampy grasslands and former head hunters live in unspoiled tribal villages with longhouses, but Northeast India is such a place. Nagaland, Assam and Arunachal Pradesh states are relatively unknown and are uncharted as a tourist destination. Only a few hundred foreign tourists a year visit these areas. Therefore there are only a few tourist facilities in these States: the overnight accommodations are very basic and the roads are bad. That will all change, but now is the chance to experience unspoiled life. A very good reason for us just to choose this destination now. The trip promises to be a real adventure. Certainly for us. 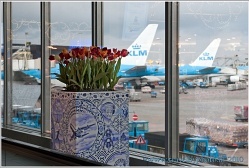 We travel as a couple and the trip is, unlike previous years, not organized by a travel agency in the Netherlands. During our trip trough Ladakh we have met Henk Thoma of Vajradhara Travel Services. We got a very good impression of his organization, his service, dedication and the enthusiasm and knowledge of its employees . Because information and travel offers to the North East of India are limited, we decided to approach Henk for information and advice . It eventually led to a job. A golden choice we can say now. Henk and his contacts in Delhi and Arunachal Pradesh have created a fine itinerary and a flawless organization. If you click a picture it will be enlarged. The pictures can then be viewed in succession as a slideshow. If you see a link, for example: Vajradhara Travel Services click on the link and it will be opened. 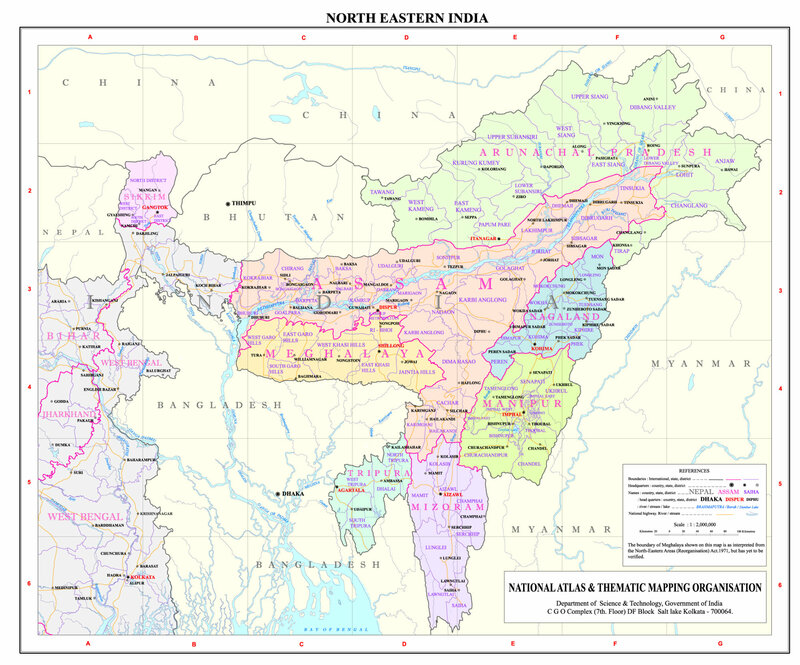 When referring to a map, the map can be accessed by clicking on the link map of Northeast India. The clips (images with an arrow) that are included are HD recordings. The clips can be viewed in a separate window that automatically opens when you click on the image with the arrow. Today we have both worked half a day. In the afternoon we clean up the house. We check and weigh the bags and after some deliberation we both load a pack wine in our suitcase. We have heard that Nagaland - our first destination - is a dry state with regard to alcohol. Waked up in time by two alarms and two telephones. With the bags to the car. The sound of the wheels of the bag sliding on the pavement cause a nice holiday feeling! We drive from Schagen to the home of Marjon, our daughter, in Akersloot. Bram her friend will drop us at the airport on his way to work. We travel via Vienna to Delhi. Smooth handling at the check-in desk. We have plenty of time. 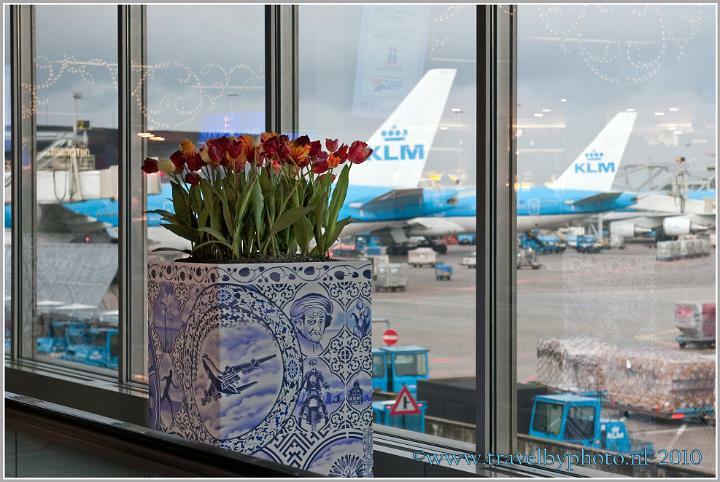 Schiphol is always fun to wander around. Everywhere movement never a dull moment. The plane leaves more than 20 minutes late from Amsterdam, while we only have 50 minutes transfer time in Vienna. When we arrive in Vienna we have to hurry. We take a huge spurt. It is not easy, we have to find our way in a maze. A movable belt is available but it is going in the wrong direction! Finally we are there. The flight attendants already clap against their legs: hurry up! Exhausted we rush into the plane. We made it!!! The plane takes off, we have good seats, the two of us next to each other, without a neighbour. The meal on board is good. chicken, potatoes, salad, a small piece of carrot and a glass of red wine. We arrive around 00:40 am local time in Delhi. In Delhi, the time is 4.5 hours ahead of Amsterdam. It is pitch dark outside. We are neatly picked up at the airport and dropped at our hotel, hotel Pluto Inn. It is 02.00 am when we arrive at the hotel. We have a nice room, but we cannot enjoy the room for very long. At 05.00 am we will be picked up again for our flight to Calcutta. What a hassle at the airport! On our flight to Delhi with Austrian Airlines, we were allowed to take 23 kg of luggage per person. A grumpy lady at the check in desk of Air India informs us that on a domestic flight only 15 kg of luggage per person is permitted! What a misery! We get some stuff out of our suitcases and put it in the hand luggage. We still have to pay extra 4 kg overweight, but that should be paid on the other side of the departure! Thus, a long walk and pay (we seem to have to pay double because we have a switch!). Then back to the first lady, showing proof of payment and the luggage can finally be checked in. At 07.00 am hours the aircraft leaves for Calcutta. 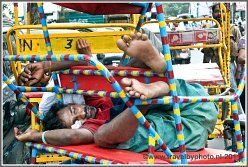 In Calcutta another hectic situation. We have to change flight to Dimapur (map), but the signs at the airport include only references in the Indian language, and so we have no idea where to go to. Finally we find the right plane. Smooth flight. When the plane lands we want to step out. Wrong idea; there appears to be an extra stop. A number of passengers are leaving the plane, but we have to get back to our seats. Two security guards check all bags in the luggage hatches. Whose bag is from who ... All to make sure the people who have left the plane didn't leave any luggage. Well rightly so. The plane takes off for the last part of the flight. Finally we land in Dimapur - Nagaland (map)! At the airport we meet our chauffeur and guide. A nice, fairly young man. Bully (Bengia Mrinal) is his name. He has a good car with him. We drive straight to Kohima. 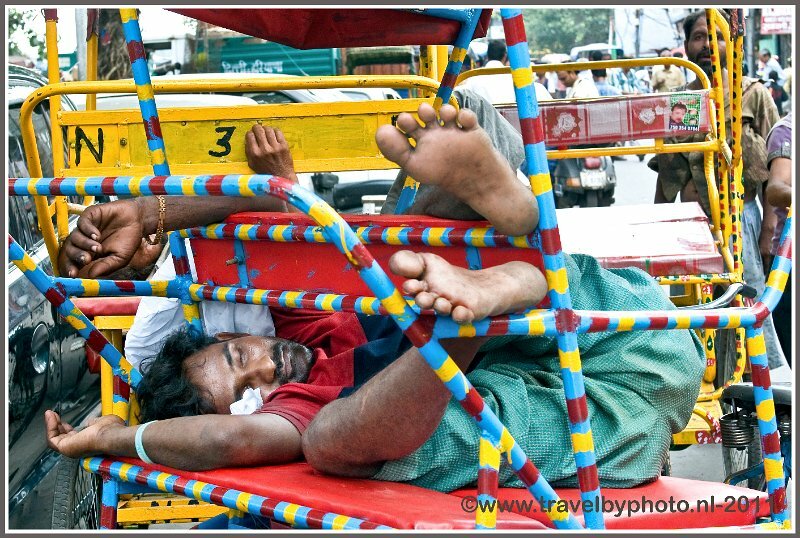 As soon as we hit the road it's right back India again! Chaos, dirt and people wandering around and making fires. It's 28 degrees. Gradually we drive into the hills. It's pretty green here. In distance it is a 2 hours drive from Dimapur to Kohima, but it takes us more than 3 hours. We understand that it 's always busy here, but now it's even more busy because of the Hornbill festival. Moreover, tomorrow the President of India, Shri Pranab Mukherjee is coming to Kohima to open the festival. It's an anniversary festival. The Hornbill festival is held for the 50th time this year. Poor Bully; he has already driven 450 km to collect us and now he is held up by traffic congestion. Our hotel in Kohima is Blue Bayou hotel. We have a nice, and very large room. There is TV and internet, but ... Bully warns us: this will be the best hotel we will get during the whole trip ! We order "vegetable rice" and tomato soup and drink a glass of our own wine. We go to bed early. It was a long journey. 6:30 am the alarm . We slept very well . At 07.00 am we have breakfast. In the morning we have no appetite for hot Indian dishes. So we take toast with jam. The toast is very tough ... But everyone is friendly. Our bathroom is big but not really laid out logically. On the far right is the shower, on the far left is the shower drain. The water flows from the shower, under the sink, past the toilet, to the drain. We try to understand the logic behind the creation of this artificial river in our bathroom: we do not succeed. Bully is waiting for us at 07:30 am. We drive to the Hornbill festival. This festival, which is held annually from 1 to 7 December was originally not a traditional festival but nowadays it is the main festival in Nagaland where you can see many traditions of the different tribes. During the festival, the various tribes of Nagaland gather in the Kisama Heritage Village (a kind of open-air museum, about 10 km outside Kohima). The members of the tribes wear their original attire and perform their dances, ceremonies and rituals to the members of the other tribes (and visitors). It is very busy on the road! During the festival it is always crowded, but now that the president pays a visit to the festival it is even busier. Every 50 meters along the road stands an armed soldier. When we arrive at the festival terrain, we have to walk through detection gates. The alarm sounds but we can just pass. We have a nice seat on the edge of the stage where soon the president will sit. Bully gives each of us a scarf from a tribe in his home state, Arunachal Pradesh. Ingrid one of the Apatani tribe, Jan-Arend one of the Nishi tribe. The weather is lovely. Most Indian tourists are like children. On a large screen images of the audience are displayed. If the tourists see themselves on screen they become crazy and start yelling and waving at themselves. The adults the most! It takes quite a long time before the president arrives. A long line of warriors stands up for him as a guard of honor. That's all rehearsed beforehand. The red carpet is extra swept. The president is only a fairly small guy. We all rise for the national anthem. The President gets presents and delivers his opening speech. What follows is a firm hit on a big gong by the President and the festival is opened. All kinds of performances are staged. Some are fun, others less. We find the warriors the most interesting. The weather is lovely; exactly the temperature we like. About 25 degrees. At first just sunny, later occasional cloudy. You experience that the Hornbill Festival is a eagerly awaited highlight of the year for the very proud participating tribe members. Around 13.00 hours, the program has ended. When the program has ended, the tribe members gather together in the festival village near their own show houses and traditional Naga morungs (boys dorms) and drink and sing exuberantly. We walk around for a while in the village. It is easy to take photo's. All collaborate when we take photo's. The atmosphere is relaxed and cheerful. In the past, Nagaland was an unsettled area. There were a lot of conflicts between the various tribes and they certainly did not treat their enemy gently. The stories about killings, wars and head hunters are numerous and gruesome. It was hard for the English colonial administration to control the tribes of Nagaland. Therefore, in the middle of the nineteenth century, the missionaries were send in to Christianize the tribe members. Initially, the missionaries were also unable to set their influence on the tribes, but finally they managed to convert the warriors. About 99 percent now seems to be Christians! Much of the Nagaland traditional culture has been lost with the introduction of Christianity in one fell swoop. Therefore, this festival is so important for the tribes. It offers the opportunity to still keep something of the old culture and traditions alive and also to fraternize. At noon we enjoy a lunch with Bully; Indian vegetarian and really, really tasty. The moment we want to leave the festival, we see the start of a very special competition; the Naga King Chilli Eating Contest. The challenge is to eat in a row the biggest number of the hottest chillies in the world ... Big, sharp chillies. The winner of last year has eaten 17 chillies. Several participants squirm at the inward work of the chili 's puking all over the stage. When we actual leave the festival terrain an ambulance is passing us. Bully thinks that one of the chili participants is discharged ... what a game! It's 4 pm when we are back at the hotel. We take an hour rest, charge some equipment and take a cup of tea. The sun has already given us a healthy tint. Fortunately: we do not suffer from jet lag. The introduction of the Christian culture in Nagaland has also caused Christmas to become an important holiday in this part of the world. We discover, to our surprise, a Christmas wreath on our room door. The handrails of the hotel are decorated with pine garlands and a large Christmas tree with packages underneath is exposed in the street. We even see a plastic snowman burning in the sun. Strange experience. Our flight away from the Christmas madness in the Netherlands is singled out here in sunny India. It's getting dark at about 5 pm. Pretty early! The hotel offers a buffet for diner in honour of the festival. Delicious food. We both slept well tonight. We drink morning tea in our room and then leave for breakfast. 8:00 am; departure time for Day Two of the festival. Now that the President is gone, the atmosphere at the festival terrain is clearly more relaxed. As soon as we enter the festival terrain we are surrounded by beautifully dressed men and women so we can progress with photographing and filming immediately. Representatives of all tribes blow their horn. We attend the festivities at the Main Area of the Naga Heritage Village Kisama, for about an hour after which we leave for a walk through the village. All the dancing is nice but at some point you have seen it. It is fun to wonder around the various tribes. We enjoy the cheerful atmosphere in the village. We ourselves are regularly photographed; We prove to be an attraction. At noon we have lunch in the same eatery as yesterday. It is very tasty again! Not too tart, just right. Ingrid bought a beautiful necklace this morning. After lunch we visit just an ordinary Naga village near Kohima. We take an extensive walk through the village. Very interesting. Many corrugated sheets are used in the houses, but it does not really rickety to. Chickens are running around and almost every house has a loft with a pig in it. Later we will see a lot of stray pigs. The people are extremely friendly. The tribes of Nagaland always wanted to be independent, but that drive doesn't deliver a very successful story. First the warriors were convinced by the Japanese to join them in the fight in the 2nd World War in exchange for independence. Successively the Indian government promised the Naga people that they could provide Independently if the tribes were willing to fight on their side. The outcome is predictable. The promised independence never came. Therefore, there is still a lot of anger in Nagaland towards the Indian government. Now there is peace, but it is not entirely comfortable. After our visit to the village we return to Kohima. Predicament drive for Bully Heavy traffic, but we sit comfortably at the backseats of the car. 8:00 am departure from the Hotel. Our last day at the festival. The weather is excellent again. About 25 to 27 degrees in the sun. You should not spend too many hours sitting in the sun; the sun is really burning. There will be some clouds during the day but it will not be cold. In the morning, we attend the performances of the tribes at the main arena. A scene is staged where the head-hunters hunt for human prey. They show how they sneak up on people. At one time an attack with a lot of smoke and banging. Limbs and a severed head are proudly shown as trophy's. All in all fake of course but done with much passion and enthusiasm. We walk a lot of steps up and down in the festival village; we will really feel our back and calves at the end of the day! We drink coffee at a coffeehouse of one of the tribes; the weakest coffee ever drunk! But it costs only 15 rupees and the cup cake that is served with the coffee tastes delicious. At lunch we meet the Consul General of France, Mr. Fabrice Etienne! We had already seen him walking around the festival terrain in his suit with a very striking necklace around his neck. He looked like a typical tourist, but now we understand that the necklace was an official gift. The chain was officially hung around his neck during the morning ceremony as a sign of respect. He sits at our table and we have a pleasant conversation. Fabrice Etienne lives and works in India (Calcutta) now for 1.5 years. Previously he worked 4 years at the consulate in Burma. Since we have been inBurma last year we have plenty to talk about! After lunch we drive back to Kohima. Before we reach the city we stop at a local market. The merchandise on the market looks very different than the merchandise on our markets; dog meat, lots of worms and larvae in different sizes and colours and ... alive ... brr. Bags packed with live frogs who want to jump out of the bag. Mice in a cage. Delicacies for the locals but not for us. In addition there is also lots of vegetables, potatoes and fruit of course. We hear and see only a few stray dogs in Kohima. As a result the dogs don't keep us awake at night with their barking and that is nice. But when we see them lying skinned on a market stall we think ... oké doggie ... please run and bark as loud as you can! Everything better then a slaughtered dog. Bully explains: in Nagaland everything that walks, flies or swims is eaten, except for trains and planes. Three- days festival in Kohima was great but now it's time to move on ..
Today we will drive to Mokokchung. We leave for a ride through the hills. Beautiful scenery. Villages on the peaks here and there. It is very green; full of vegetation. We were warned in advance that the roads are very bad. And they are. Many twisting is required to avoid deep pits. Heaps of dust. The plants and flowers are also covered by a thick layer. The weather is nice again. On the way to Mokokchung we visit three villages. The first village we visit is quite boring. It was the home village of an important politician and therefore declared a tourist village. We see nothing special. The second village called Tseminyu is very nice to walk through. Old houses, mostly patched with boards and corrugated sheets. The big baskets containing stock placed in front of the houses are impressive. The third village, Longkhum is a village of the AO tribe. Many original homes and many Christian slogans. We enter a house where an older couple lives. Nice people. Kids are flying kites with homemade kites of newspapers. Late afternoon, it's almost dark already, we arrive at Mokukchung. The only hotel in Mokukchung is Hotel Metsüben. We get a spacious room with coffee and tea facilities. We really feel a big appetite! So we order French fries in the room as a starter and we drink a glass of wine; yummy! We have diner in the restaurant. Rice with curry and vegetables. We ask for an extra towel, because there is only one in the room. The shower let us choose between burning or freezing; There is no middle course. We drive through a singularly beautiful landscape of rolling hills. The environment is wooded and green. The road is very bad! We continue to amaze us about the signs of Christianity. Red poinsettias, snowmen and heavily decorated Christmas trees. We stop in a village and pay a visit to one of the houses. We are warmly welcomed. The people have a lot of kitchen utensils. In the kitchen/room is a large open fire place. The ceiling is completely blackened. The mountains with all the different layers are so beautiful! Beautiful peaceful villages here. It looks as if the houses on one side on stilts are glued to the slope. Many people with baskets filled with branches and brushwood on their backs. The band of the basket is on their foreheads. At one time we cross the border with Assam. The landscape and the people in Assam changes instantly. Most residents of Assam are Hindus and you can tell right away. Temples everywhere and of course a lot of cows in the streets. We had missed them. Assam is famous for his tea plantations; you see them immediately as you cross the border. We hear that the harvest is actually pretty much ended. The leftovers are still picked. In March the harvest begins again. The road is a lot better, but that turns out to be temporary. At noon we find a good spot for lunch. Rice, dal, etc. We arrive in Mon at 5 pm. Our hotel appears to be the only hotel or guesthouse in Mon; the Paramount Hotel. The hotel is run by an old woman. She is in full control. We are warned that the accommodation will be very basic, but actually it is not too bad. Hard but clean bed and a bathroom. We initially have electricity. Later, the electricity goes off and we get a candle and a extra flashlight for in the room. In Holland it is St. Nicholas-day today (a popular traditional festival in Holland where children get gifts). In the evening we explain Bully the meaning of 5 december in Holland. At that moment a Dutch travel group enters the dining room. Much to our surprise. They organize a colourful St. Nicolas evening and ask us to participate. We prefer to enjoy the party from the side. The group has a lot of fun. So do we. At 10.30 am everything nicely quiet again. We have a room next to the kitchen and dining area.